Are you guilty of having an occasional setback when it comes to your personal financial goals? It might be helpful to realize that even personal finance bloggers are prone to make financial splurges every now and again. 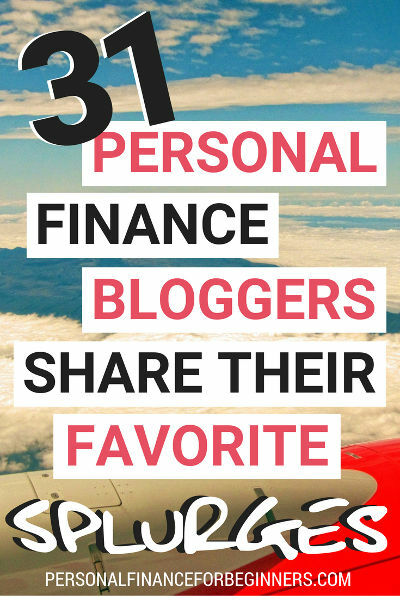 If you’ve followed the Beginner to Blogger series at all, you’ve already seen that personal finance bloggers are diverse and a lot like yourself! Today is National Splurge Day, created by self-proclaimed “eventologist” Adrienne Sioux Koopersmith. She claims to have created 1900+ holidays and might just be the reason it feels like there’s a holiday for everything! Are you guilty of any of these same splurges? Every year we travel to Playa Del Carmen Mexico and stay at an all-inclusive resort. Totally luxurious and non-frugal. We usually go in March when it is super cold where we live! My favorite financial splurge is traveling. The experiences I gain from travel are priceless. It’s like spending money to gain wisdom, culture, and fun. By traveling around the world, you can learn how others interact, improve your social skills, and become more worldly. I never hesitate at the opportunity to learn from someone in a different country. Just days prior to our departure, we caught a wild hair and decided to cancel the trip to Mexico and go to Italy instead. Who wants to sit inside for a week at the beach? I was able to negotiate ticket changes with no additional fees, canceled our hotel and started planning. Italy was my wife’s dream vacation, so she was ecstatic, and a bit shocked. We had budgeted and saved for the Mexico trip, so we were prepared and splurged on the difference. In less than 2 days, we developed an itinerary, booked flights/hotels and were set for a trip to Italy. Both the trip to Mexico and Italy are undoubtedly a splurge. However, we enjoy traveling, and we’re financially secure, so we accepted the splurge. Italy turned out to be amazing, and we’ll never forget the memories we made! My favourite financial splurge is to give myself a nice vacation. I am a self-entitled millennial and I absolutely need to take a break from “real life” every so often. I usually take one big trip once a year, coupled with a few weekend trips. I consider my financial splurges well justified as I always return to reality feeling more refreshed and motivated than ever! Other than my vacations, I tend to lead a very frugal lifestyle. On a good month (if I’m not travelling) I save about 20-30% of my monthly income – and I am on a student income! My friends and family often wonder how I afford to go on vacation so often. The secret is to find cheap deals and go on vacation during off-season. I have saved hundreds that way. And usually, I try to find cheap accommodations through Airbnb or even Couchsurfing. The next big vacation that I’m saving up for would be Iceland. I really want to go to see the northern lights and I’ve been holding off because Iceland is very expensive. Let’s see if I will cross it off my bucket list this year! Travel is by far our favorite splurge. Our “Why of FI” – why we chase financial independence, and also why we’ve chosen to homeschool our kids – is in large part so that we can travel and see the world. We absolutely think it’s well justified – there is no better teacher than traveling and seeing the world, and it’s really our only big financial vice. We don’t love fast cars or fancy clothes, but we want to see the whole world – one of our goals is to get our kids to every continent before they turn 18. We’re taking them to their 2nd continent this summer (Europe) but we have a little time – they’re only 1.5 and 7. We balance our travel by cutting costs where possible (travel hacking, staying in AirBNBs) and by continuing to work; I work online, so I can work from anywhere with an internet connection. We’ll be in Ireland for a month in August, and I’ll be able to work the whole time (although I did cut back on work commitments just a little bit so we can have a better work/fun balance for that time!). We stick to a budget, track all my expenses, and forecast my returns on investments, but every few years we go on a major money splurge. The splurge in question is travel, and it’s not always cheap. Especially when you are traveling from New Zealand. Our first splurge was to Europe. We spent a week in London, a week in the Netherlands, flew past the arctic circle to Lapland in Finland to see the Northern lights, and finished with a tour around Italy. Our second splurge was to East Africa, where we traveled around the great lake Victoria through Tanzania, Kenya, Uganda, and Rwanda. Climbed Mt Kilimanjaro, visited chimps and gorillas and went on a safari. Our third splurge was to USA and Canada, where we traveled from Jasper Canada down to the Grand Canyon USA. We visited more than 15 national parks, witnessed the solar eclipse in Utah, and hiked through some amazing nature. These financial splurges don’t come cheap: it takes us about 2 years to save up enough “travel money” and vacation time to go. Travel money is different from real money, and it is always spent with less thought than real money. It’s hard to know if these splurges are well justified or if they are a vice. On the one hand, the experiences will last me a lifetime. On the other hand, I will spend more of my life working to pay for them. But we have come to the conclusion that traveling is definitely worth it! And we would rather do it now, than when I am retired. Justified spending or not. Drinking coffee throughout the day makes me more productive as a real estate investor and author, although I drink in moderation and have cut my coffee intake significantly to morning, mid-afternoon and evening. Watching movies helps me to relax, get new ideas, and take my mind off of work. It’s one of my favorite things to do! I do make sure to research the movie reviews of films I’d like to see before I spend the money. My family and friends see me as the “coffee” and “movie” gal. And I have no problem with that! Single malt, Scotch whiskey. My favourites are The Glenlivet 12 year and Aberlour 15 Year Double Cask. There’s a lot more to Kara’s story than just a love for Scotch. Read our full interview with Kara from The Flawed Consumer. Food and dining are my biggest financial splurges. Eating out was always a rare treat growing up because my family did not have money. I have always loved to eat, it’s almost a weird addiction. If I don’t get my fix, it’s a serious mood killer. The fact that this “eating out” issue has caused some actual fights within our marriage – to my husband, it is a very well-justified expense because it meant he could breathe easier if I get my burrito fix. Dining out isn’t too expensive. I only gravitate to greasy spoon foods and Asian foods. None of these places are typically too expensive. I wouldn’t feel comfortable in a fancy French or Italian restaurant, nor do I have much passion for those flavors. I typically like my flavors south of the Equator. My dream splurge is combining dining out with travel so I can get real sushi from Japan. I want real Taiwanese beef noodle soup from a stall in Taipei. It can’t get more authentic than that! Backstory: My husband and I eat pretty healthy while spending as little as possible at the grocery store. Needless to say, we eat a lot of the same old same old—lots of veggies, chicken, soup—while eating at home 95% of the time. So when we do splurge, we spend our money at a restaurant! It’s almost a double splurge for us because we spend lots of money (relative to us, lol), and then eat a whole lot of delicious, unhealthy, and DIFFERENT food. It’s always a great time and something we look forward to. While we’re excited to eventually eat out more often than we currently do, we enjoy how the sparsity of it has made it super special for us. My favorite financial splurge has to be on good FOOD! I love it. Not only does it taste great, it awakens multiple senses simultaneously. When visiting the famous French Laundry in Yountville, California, we indulged in an experience. It’s something that’s hard to explain, but it was undeniably satisfying. Being able to enjoy this super expensive meal with my wife and closest friends made it all the more memorable. My favorite financial splurge is craft beer. I just can’t bring myself to drink the mass-produced, brand name stuff. You just can’t beat the flavor of a locally brewed beer, and I’ll take quality over quantity every time. I realize it is a bit of a splurge but I’d rather cut back on something else so I can afford an outstanding IPA or stout. At the age of 19, I spent 3 months backpacking around Europe. Outside of the amazing culture, history, people and adventures, one of the biggest indulgences I partook in was beer drinking. This wasn’t the same cheap beer I was drinking back home as a fun-loving teenager. This was high-quality beer being brewed at local breweries for small pubs and local drinking holes. In England, the Czech Republic, Ireland, Spain..and a dozen other countries. The quality of the beer and ambiance of the experience shifted my beer consumption habits for life. It’s been almost a decade since then and my “vice” remains high-quality, craft-brewed or premium beer. Is it more costly than normal beer? Yes. Is it an unhealthy and likely detrimental? Yes. However, I’ve made other monetary and health efforts to offset this “vice”. I workout or run 4-6 days a week and walk to/from work every day. I don’t have cable, rarely eat out and cut back across most areas of my budget. This “vice” is a common thread across my family, friends and social circle. It’s a point of enjoyment and passion for us. Do the pros outweigh the cons? Time will tell. My favourite financial splurge is to have cable TV. I know it goes against the rules of most FIRE bloggers but Mr2p loves his wildlife, gardening and DIY programmes, all of which are on the smaller channels only provided by cable in the UK. I would be happy with the free TV but marital harmony is worth splurging for. If Mr2p is happy then I am happy. It also means I get to eat chocolate occasionally as my treat for patiently watching the latest wildlife programme with him. And I’ll do most things for chocolate! Cable and chocolate won’t make the difference between us FIREing or not, although it may have added a month or so to our FIRE date. But you’ve got to live whilst saving for FIRE and a girl’s got to have chocolate! For us, it is having two cars. 1) Living in the suburbs, it is so practical to have two cars but of course, it is not a necessity. Especially since we both work close to home, we could make it work with only one. 2) It is well-justified, we like to be free to go anywhere without too much planning. 3) We drive two cars but they are both over ten years old! We bought them cash, without any payments or interest. That’s a huge plus. 4) We budgeted for it. It is not a huge strain on our lifestyle. 5) We are looking to upgrade our SUV soon. Who knows? We might get a 7 or 8 years-old one 🙂 What a luxury! Central Air! We love being comfortable in our own home. When it’s hot and humid, I love being able to set the thermostat to 70 degrees. We went so far as to over-insulate the home and install solar so we can enjoy our cool air guilt-free. It reminds me of my accomplishment! I really thought I would do a blowout purchase after I finished paying off my student loan debt ($112k in 18 months) but I felt too afraid to spend on anything lest the gods open up and devastate my bruised and battered finances. Instead, I saw a Kitchenaid Stand Mixer for a little under $200 and thought, well, even if I lose my job tomorrow, I could probably sell this for about cost. I never really thought of myself as a baker, but I love my stand mixer. Not only is it really useful, but it reminds me of my accomplishment! As crazy as it might seem, 2018 is the year of lifestyle inflation for my wife and I. After several years of extreme frugality, we’ve chosen to reward ourselves in a few areas: health, community, and some things we actually need. The key, though, is that we are making sure our spending can be scaled back as quickly as we increase it…no debt and no long-term commitments. We’re planning a vacation with some of our closest friends, buying some much-needed furniture, and buying some clothes to transition to a more minimalist closet. Our favorite, or at least most common, financial splurges is home repair and remodeling. The first time we sold a house, we ended up paying to have quite a bit of work done for the next owner to get the deal done. The experience helped us realize it makes more sense to go ahead and do more repair and renovation work for ourselves to be able to use and enjoy while we’re living there. We still do as much as possible ourselves, shop around, and avoid extravagance. But we’re thrifty enough to know there is value, and usually even some financial return on investment, for making quality improvements to a home. My splurge is a whole category of items: kitchen equipment. I’m perfectly OK using simple and cheap tools when they will do just fine (or better), such as cast iron skillets. But when it comes to certain tasks, I want the good stuff: a high-speed blender, a large dehydrator with a back fan, a convection oven, sharp German knives, a powerful mixer, and not one, but two electric pressure cookers. My justification: I use them regularly, they help keep us from eating out and spending money unnecessarily, almost all of them come with long warranties, they have great resale value (should I ever change my mind in a fit of minimalism) – and they give me much joy! No complaints from my husband so far. I think he knows which side of his bread is buttered. Or rather, which side of his cast-iron baked, crusty sourdough boule is spread with cultured, hand-churned, fleur de sel butter. Winters in the northeast are rough, and I’ve always settled for a cheap jacket that had to get replaced pretty quickly. Two years ago, I said “enough is enough” and dropped $300+ on a nice winter coat. My girlfriend got one too, and since then, my thoughts about high-end clothing have changed immensely. The quality of the item is high and the difference an actual good winter jacket makes in making you not hate winter is huge. Since then, I’ve exchanged all my socks for $20 per pair of wool socks and have gotten an expensive rain jacket as well. I think a fall jacket is next. My girlfriend feels the same way, too, so it’s not a contentious discussion when I want to spend a few hundred bucks on a nice long-term piece of clothing. Now I just need a nice fall jacket and I might be all set. People seem to think spending $20 on a pair of socks or $300+ on a jacket is weird, and I used to think that too. However, these pieces last a lot longer and many have lifetime warranties too. It might seem like a high upfront cost but over the course of a lifetime, it’ll be cheaper than getting a cheap jacket every other year, not to mention, much, much better. After my first year of running my side hustle, I got a surprise at tax time and owed the IRS $4,000. I hadn’t taken any profit yet but after that, I decided to treat myself to the same amount that I had to pay in taxes and bought myself an Omega Speedmaster Pro watch (used of course) for $2,700. Want to learn more about J’s financial goals? Read our full interview with J from Their Money Goals. I don’t like cheap shoes. I like the Johnson and Murphy brand. I spend about $150 for a pair, but they last 4-5 years. I think they are the brand that was considered the most popular by millionaires in the book The Millionaire Next Door. Read more about Dave’s personal finance journey in our interview with The Financial Journeyman. My wife Lily and I recently discovered a love for skiing, because it’s such an active sport that it completely takes our minds off work and responsibilities. However, we’re beginners, and so have spent thousands of dollars on ski vacations (including lessons). To reduce the cost, we travel-hack hotels and flights, but we still have to pay cash for the equipment, lessons, and lift tickets. It’s worth it to us because we really enjoy it and it’s one of the few things that truly clears our heads. The Winning Personal Finance family loves to travel. My favorite type of trip involves mountains, skis and lots of snow. When we were looking to reduce our spending to live on one income, the first luxury item I added to the list was our annual ski trips. Skiing checks so many of the “happiness” boxes for me. It’s a great way to spend quality time with friends and family. I always enjoy being surrounded by the natural beauty of mountainous landscapes. Plus, the best kind of exercise is when you’re having fun. As a slight adrenaline junky, the thrills from skiing fast and difficult terrain are unmatched. Problem-solving comes into play when the easiest or safest way down a run is unclear. Lastly, challenging myself to be better and ski runs I’d never have thought possible ensures it’s never boring. Unfortunately, skiing is not exactly cheap. As a luxury item, it’s obviously a splurge. To keep the costs within budget, I do lots of advanced planning. I book trips that are affordable while still providing the maximum reward. A couple years ago, a friend peer-pressured me into playing at a casual poker tournament downtown. I didn’t know any of the rules, but since it was just a $5 “donation” to play, the cost of losing was low. It didn’t take long before I was hooked. While poker certainly has a gambling element to it, I enjoyed the probability-based element of the game (expected values, counting outs) as well as the social psychology aspect (playing your opponents and your position at the table). I’ve kept my poker play at casinos and larger venues to a minimum, but I still continue to play a game of poker with some friends on most weekends. Over the past two years, I’m probably down $200-300 overall. Even on those days when I’ve “thrown my money away” by making bad poker decisions or facing “bad beats,” I don’t consider this financial splurge to be a bad thing: I’ve enjoyed hundreds of hours of stimulating poker table decision-making and conversations… And, I guess, even helped pad my friends’ wallets just a little bit! Experiences. I recently “paid up” to go see Dave Chappelle perform stand-up live in West Hollywood with a sub-100-person crowd. Totally worth it. My favorite thing to splurge on is experiences. The weekend before last I splurged on an unplanned jet ski trip to Pensacola, Florida. I had been telling my friends I wanted to jet ski for a while so that is what prompted the splurge. I considered my spurge to be well-justified because it allowed me to escape the daily grind for a couple of days. Escaping the stresses of life gave me time to recharge so I could be ready to grind some more! My friends were happy for me. They told me, “We are glad you finally got to go jet skiing!” I had such a fun time that I want to go jet skiing again before the summer ends. Here are the only two things I regretted: choosing to jet ski for 30 minutes instead of a full hour and not parasailing. Parasailing is something that remains on my bucket list. Maybe I will try that, too, before the summer ends! Read more about Sarah’s personal finance journey in our Smile & Conquer interview here. 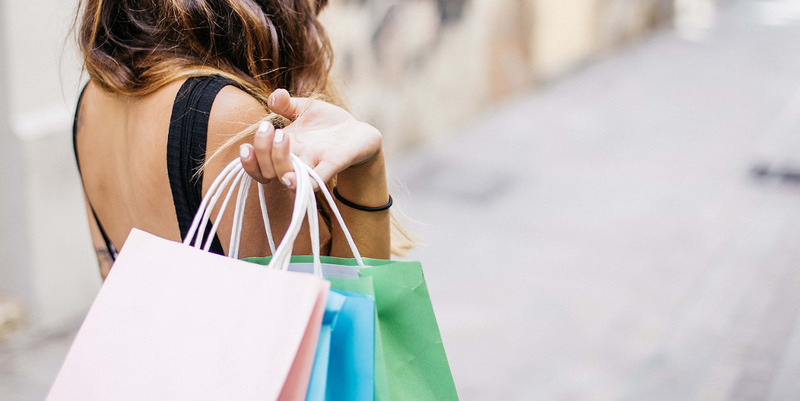 Treating yourself to an occasional financial splurge doesn’t have to keep you from reaching your money goals. While money is an instrumental and necessary tool in life, it doesn’t have to dictate your every decision. Take a moment to consider how money can be used to bring greater joy and satisfaction to your daily life. Reaching your long-term financial goals requires patience and discipline, but don’t forget to reward yourself along the way! What’s your favorite financial splurge? My Tesla. I support a great American company which employs American workers with American ingenuity. The car does not cost me a penny for energy because I also bought solar panels for my house. I am helping save the environment by keeping our air clean. And I have saved thousands of dollars in filthy gas, maintenance, and oil changes over the last four years over the regular expensive ICE cars (internal combustion engine). That’s a fun splurge! I think many people’s cars fall somewhere between “favorite financial splurge” and “worst financial decision.” Sounds like your decision is definitely the former – something you appreciate that reflects your values. Nice! Great round up! Very interesting to read about what the FI community splurges on. And it is great to see that it is mostly splurges on is experiences! What a fun post… I like how most of these things are pretty normal expenses in a typical household…like food and drink… but that’s mine too… something typical but splurgy in the FIRE community for me are: cable tv and take out! Nothing like a lifetime movie and thai noodles!